Jackson County on the Gulf Coast played an important role in Mississippi’s early development. Founded in 1812, it was named after Andrew Jackson. For much of its history, artists have flocked to Jackson County, establishing a unique art community. Compared to other parts of Mississippi, Jackson County is ethnically diverse and has few farms. Instead of depending on agriculture, the county developed mammoth timber and transportation industries. The county’s recent history boasts population growth, industrial development, and increased government spending. Major cities include Escatawpa, Gautier, Moss Point, and Ocean Springs. The county seat, Pascagoula, became one of Mississippi’s largest cities in the mid-twentieth century. Because of its geography, Jackson County is vulnerable to the natural disasters common in coastal areas. The founding of Jackson County dates to the 1600s, when French and then Spanish colonists encountered Native Americans on the Gulf Coast. These Europeans as well as some English and German settlers in the area interacted with the Biloxi, Pascagoula, and Moctobi tribes. In the 1690s French colonizer Pierre Le Moyne, Sieur d’Iberville, established several Gulf Coast forts and settlements, some of which eventually became Gautier and Ocean Springs. Iberville’s commandant, Jean de Sauvole, built Fort Maurepas (the foundation of what became Ocean Springs) and developed relations with the Biloxi and other tribes. These relationships assisted the French in obtaining land for municipal development. Spanish settlers later took control of the area until 1810, when Spain relinquished this land to the US government and the area became part of Mississippi Territory. In 1812 the Mississippi government divided the area into three counties: Mobile County to the east, Hancock County on the west, and Jackson County in the middle. Jackson County had few residents in the early 1800s. According to the 1820 census, the population consisted of 1,300 free whites, 321 slaves, and 61 free blacks. The county subsequently experienced significant growth, doubling by 1840 to 2,955 whites, 1,087 slaves, and 80 free African Americans, the second-highest number in the state. Jackson contained the fewest improved acres of farmland in the state in 1860. Unlike most of Mississippi, its farms produced very little corn or livestock, and it exported the smallest amount of cotton in the state. Jackson County did, however, rank thirteenth in rice production and eleventh in the value of its orchards. It relied on a growing timber industry, with two sawmills in operation by 1840. In 1875 the state’s first wood treatment establishment opened in Pascagoula. These industries continued to grow. In 1880 Jackson County had only twenty-three farms, almost all of them run by their owners. A cotton depot opened in Jackson County in 1819, the Round Island Lighthouse began its work in 1832, and Pascagoula was a popular steamboat stop. All of these factors made Jackson one of the earliest areas in the state to attract tourists, initially drawing travelers intrigued by salt water and seafood. Because of its proximity to waterways, the county built a reliable transportation industry. Mirroring other counties in the state, Jackson contained a high number of Methodist and Baptist congregations. In 1860 Jackson County had fifteen Methodist churches and six Baptist churches. The county’s two Catholic churches expanded as Jackson attracted a more immigrants than did other parts of Mississippi, including substantial numbers of German and Irish workers. In 1900 Jackson had 478 foreign-born residents and 1,200 white residents born in the United States to immigrant parents. The majority of those immigrants were Germans, while others were English, Irish, Italian, Canadian, Danish, and Swedish. There were twice as many men than women, and many worked in fishing or canning factories. The importance of immigration and past immigrant settlement meant that cultural life on the Gulf Coast stood out within Mississippi. According to the 1916 religious census, Catholics were the largest religious group in Jackson County, making up more than a quarter of all church members. Various Methodists, Baptists, Presbyterians, and Episcopalians also lived in the county. Jackson County’s population grew dramatically around the turn of the century. Between 1880 and 1900 the population mushroomed from 7,607 to 16,513, about a third of them African American. The increase in population paralleled the rise of the Jackson County industrial economy. The county ranked near the top in the state in industrial employment, with 1,329 county residents, all but 21 of them men, holding industrial jobs. Michigan lumberman Delos Blodgett bought considerable timberland and employed numerous South Mississippi workers in the late 1800s and early 1900s. By the early twentieth century the L. N. Dantzler Lumber Company, with headquarters in Moss Point, was one of the largest in the state. Jackson remained a largely nonagricultural county, but its total number of farms rose to 544 in 1900. Almost all farmers owned their farmland. Jackson County began welcoming artists and developed a unique arts community. Shearwater Pottery began as an Anderson family business in the 1920s, and numerous visual artists flourished there. Walter Anderson, born in 1903, served as a phenomenal force for creativity in Ocean Springs. Opened in 1991, the Walter Anderson Museum features many of his works, including wall murals he created in the 1950s. Many other artists, some with connections to New Orleans, have lived and worked in Jackson County. The county is also home to buildings designed by Frank Lloyd Wright and Bruce Goff. 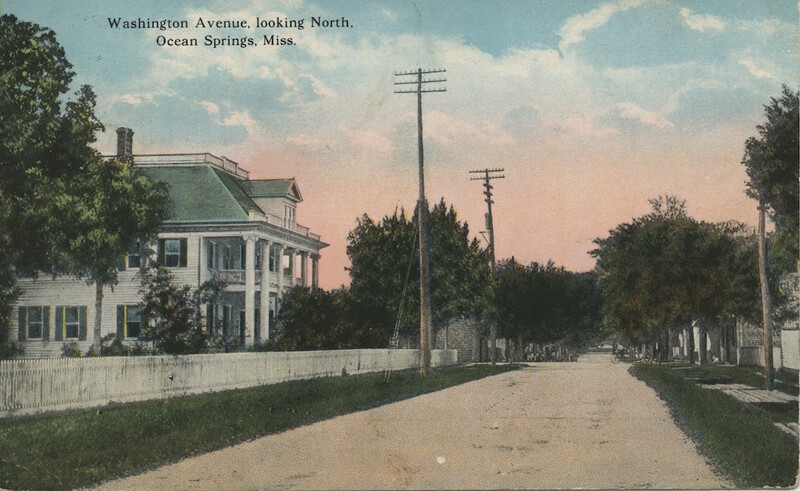 An ornamental cottage tradition with roots in the 1800s contributes to the unique architecture in Ocean Springs. Jackson and other coastal counties host numerous art groups and festivals year round. In 1930 white residents made up about three-quarters of the county’s 16,000 residents. Jackson was one of the few Mississippi counties with more urban than rural residents. In the late 1930s and 1940s Ingalls Shipbuilding, spawned by the Balance Agriculture with Industry program, brought significant changes to the area. The company quickly became the state’s largest industrial employer. Through World War II, industrial and military employers used high wages to lure large numbers of people to the Gulf Coast, and the small town of Pascagoula suddenly became a small city. One of many migrants to the area was Chester Paul Lott, who moved to the coast to work at Ingalls. His son, Trent, grew up in Pascagoula and went on to become a longtime Mississippi senator. A number of creative individuals have called the coastal county home. Singer-songwriter Jimmy Buffett, though more associated with the Caribbean and Florida beach life, was born in Pascagoula in 1946. Writer Al Young was born in Ocean Springs in 1939 before moving with his family to Detroit. Born in 1897, Jacob Reddix grew up in Vancleave and became a scholar and served as president of Jackson State College for twenty-five years. Journalist Ira Harkey bought the Pascagoula Chronicle-Star in 1949 and started a long career as editor and columnist, winning a Pulitzer Prize. Jackson County’s population more than tripled between 1930 and 1960, with the white majority growing to 80 percent. At midcentury, Jackson had the state’s highest per capita income. The number of residents reached almost 120,000 by 1980, making Jackson the third-most-populous county in the state. The county’s industrial base continued to grow, employing more than 20,000 people—more than half the county’s workforce and the highest number of industrial workers in Mississippi. The majority of those employed worked producing transportation equipment, specifically ships. More than one-fifth of the county’s female laborers also worked in manufacturing. Retail accounted for another large segment of the workforce. Jackson County also claimed one of the better educational systems in the state, no doubt as a consequence of its industrial success. The county also had Mississippi’s fourth-largest Mexican immigrant community. Jackson County suffered extraordinary architectural and human damage from Hurricane Katrina in 2005, but by 2010 Jackson County’s population of nearly 140,000 placed it among the largest in the state. That number represented an increase of more than 150 percent since 1960. Seventy-two percent of the population was white, while 21 percent was African American, 4.5 percent was Hispanic, and 2 percent was Asian.